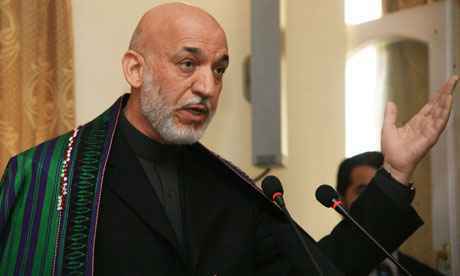 (Reuters) - Afghan President Hamid Karzai said on Monday his office receives cash in bags from Iran, but said it is a transparent form of aid that helps cover expenses at the presidential palace, and that the United States makes similar payments. The comments came after a report on Sunday that Karzai's chief of staff, Omar Dawoodzai, receives covert bagfuls of money -- possibly as much as $6 million in a single payment -- which neighboring Iran sends in a bid to secure influence and loyalty. The New York Times, citing an unnamed Afghan official, said that millions of dollars in cash channeled from Iran have been used to pay Afghan lawmakers, tribal elders and Taliban commanders. White House spokesman Bill Burton said the international community should have "every reason to be concerned about Iran trying to have a negative influence on Afghanistan." Karzai said he gets money from several "friendly countries" but named only the United States and Iran, the latter contributing up to 700,000 euros ($976,500) twice a year. He will continue to ask for Iranian money, he added.